That’s how Truman Capote describes the start of an annual ritual in his childhood home, a sprawling old place in a southern country town. His world revolves around the kitchen where he passes his days with a 60-something-year-old cousin and the dog they share. It’s an insular little world he describes in A Christmas Memory. And he makes that fact palpable by neglecting to present us with almost a single other character. But that world feels whole, as though there’s not much room for anyone besides the simple-minded lady, the seven-year-old boy and their rat terrier. Capote whittles his story to fit the shapes that memories occupy in our minds: leaving out the mundane details we might rationally ask — where the money comes from to run this big house, who does the shopping for food and prepares the meals — in favor of the stuff that feels important emotionally. We learn about this cousin and the dog, the baby stroller they use to gather pecans, what they eat together for breakfast or supper, and the big stove that heats the kitchen; not much else. The biggest part of the story he gives over to the intricate preparations necessary to turn out 31 fruitcakes with very few resources besides their own enthusiasm. So what’s so important about making fruitcakes — a confection that’s become the dull punchline of a dozen holiday jokes in the minds of Americans — and why so many? Whom are they for? Friends. Not necessarily neighbor friends: indeed, the larger share are intended for persons we’ve met maybe once, perhaps not at all. People who’ve struck our fancy. Like President Roosevelt. Like the Reverend and Mrs. J. C. Lucey, Baptist missionaries to Borneo who lectured here last winter. Or the little knife grinder who comes through town twice a year. Or Abner Packer, the driver of the six o’clock bus from Mobile, who exchanges waves with us every day as he passes in a dust-cloud whoosh. Or the young Wistons, a California couple whose car one afternoon broke down outside the house and who spent a pleasant hour chatting with us on the porch (young Mr. Wiston snapped our picture, the only one we’ve ever had taken). Is it because my friend is shy with everyone except strangers that these strangers, and merest acquaintances, seem to us our truest friends? I think yes. It’s a funny thing about Christmas. It brings out in many of us this need for connection, a need we may have shrugged off the rest of the year. And, in the best of circumstances, those of us who feel that need most keenly reach for it according to the rules of the season, doing for people with whom we want to experience that connection. 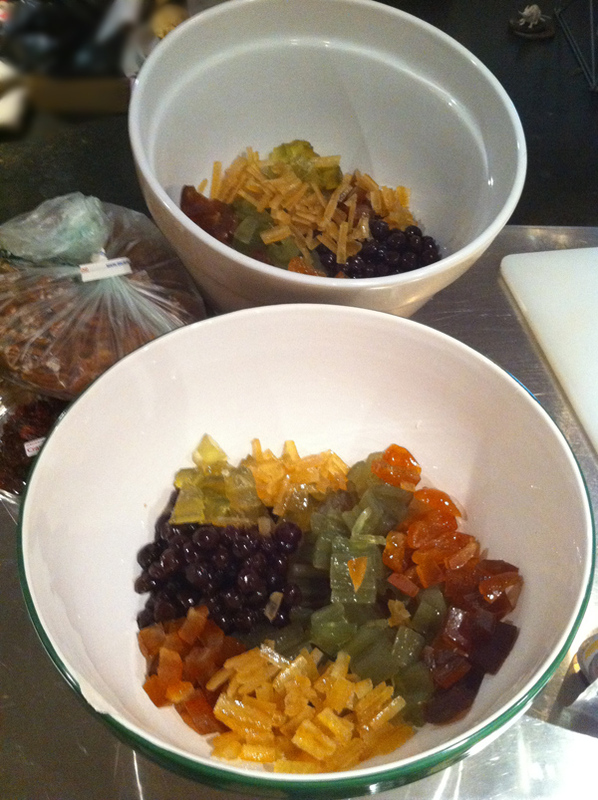 Before I’d ever read Capote’s story, I decided to start making fruitcakes for loved ones at Christmastime. It allowed me to feel connected to friends in ways a store-bought gift never could. For some reason, a gift you make yourself — and particularly food — doesn’t seem to impose the same burden of reciprocation. It’s too simple to carry any monetary value and too ephemeral, too easy to get rid of (either by eating or trashing it) to create any real bother. 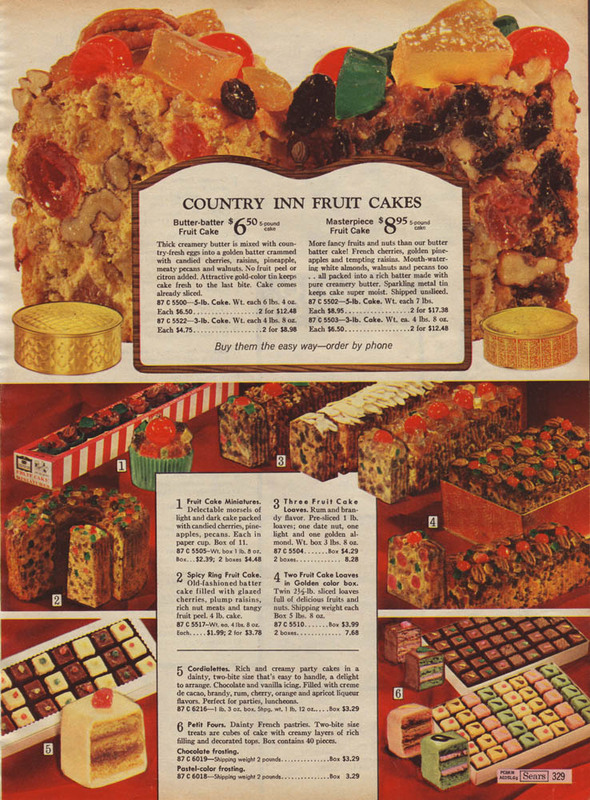 And fruitcake reached back into some collective ideal of Christmas I gleaned early on from Sears catalogs, holiday movies and the ads I saw in magazines as a kid. In the least invasive way I could imagine, a fruitcake asked people to allow me the favor of feeling close to them for a few months of the year. I could believe I was reaching back to some age-old tradition of Christmases gone by — though certainly not any tradition I knew as a child — and at the same time, reaching out to people around me in the present season. Making cakes was my willful attempt to weave a fabric of continuity that encompassed mass-cultural memories and the Loved Ones I longed for over the holidays, even if they were people from whom I’d grown distant over the years. It wrapped those friends and me in the warmth of some time-honored Christmas tradition, even if the tradition wasn’t really mine to share, borrowed as it was from my crazy idea of what a Proper Christmas would be. What did I know about fruitcakes? My childhood Christmases played out in the 1960s, in a depressed little town in central Connecticut where our only traditions were assembling our artificial tree and decorating it with the dime-store ornaments we’d carefully packed away the year before. And, as fond as I was of those ornaments, they only seemed like heirlooms because I couldn’t remember a time when we didn’t have them. This obsessive idea of holiday tradition was something I’d pasted together with the pieces I appropriated from the cover art on Christmas albums and the four-color pages of the Sears Wishbook. 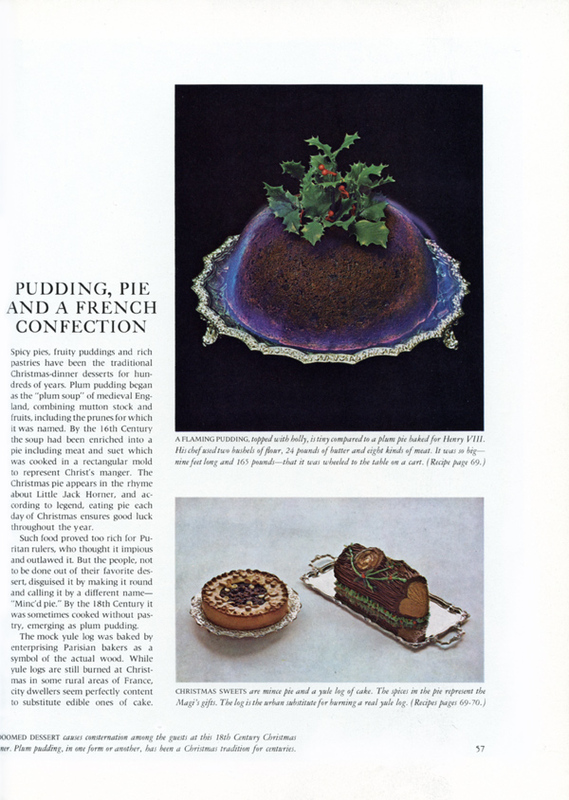 The year I announced I would make a plum pudding, it was after months of staring at the photos in our three-volume set of The Life Book of Christmas. It wasn’t all my idea, this business of mining the collective culture for memories of a past none of us had ever experienced. On the contrary: the frisson between enshrined memories and the present is a central piece of the Christmas experience. From the earliest days of our modern Christmas — beginning with the stories of Washington Irving and later, Charles Dickens† — looking back to a kinder time, one in which age-old traditions were cherished and revered, was part and parcel of the holiday. It became impossible to separate the holiday from the collective nostalgia around it, even if that nostalgia had been carefully manufactured. As a kid, I’d imagine that the very traditions I loved — listening to carols, decorating the house, exchanging gifts — were not only those I’d performed for most of my seven or eight years on the planet, but were also the same traditions carried on by those Victorian ladies and gentlemen depicted on Christmas cards or inside the gatefold of our Mitch Miller and the Gang album. As I’ve grown older, the layers have grown deeper and more complicated, blending fragments of Christmases from my childhood with those manufactured memories of Christmases from some golden era. Before my mother died, I was able to get hold of a few of those remaining dime-store ornaments. And as I take them out of storage each year, I feel myself floating in a dream spun from my own memories and those I borrowed from the images I saw around me as a kid. In the most beautiful and subtle ways, Capote recreates that same frisson of memory as we read A Christmas Memory. We’re never unclear that this is a story from the narrator’s past, a narrator who is now a full-grown and articulate adult. And to remind us, he’s careful to lift us gently from that past from time to time. The wind is blowing, and nothing will do till we run to a pasture below the house where Queenie has scooted to bury her bone (and where, a winter hence, Queenie will be buried, too). That simple aside reminds us that our story is — as its title announces — only a memory. And the memory is all the more precious because time has changed the world in which it first took shape, dissolving all the beautiful details our narrator describes. So each year, I begin the same ritual as Capote’s characters. I search for some connection to people in my life — however distant our actual connections may be — and for a connection to some golden past of tradition and ritual. 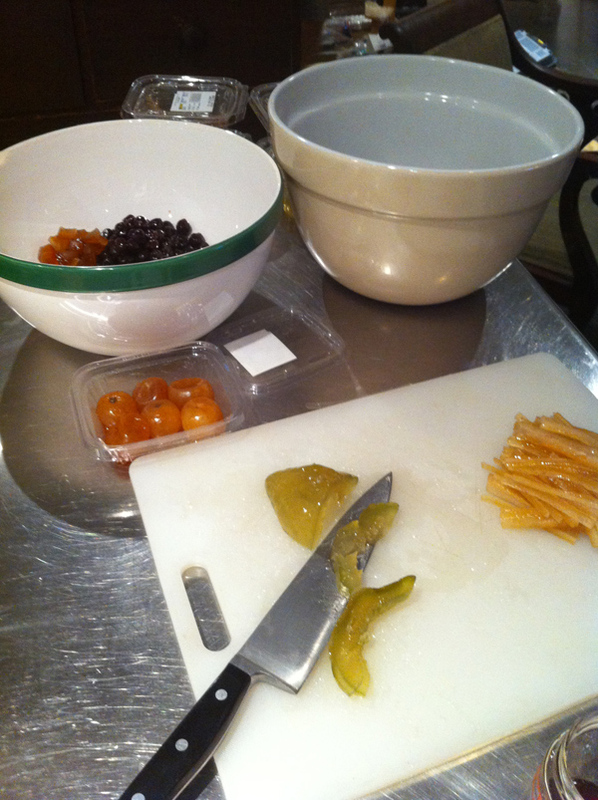 Beginning in mid-summer, I start to collect the ingredients that will go into my cakes. Fruitcake is the mirror opposite of a delicate confection. It involves no skill. What makes or breaks the quality of the cake is what goes into it. And the only reason I can imagine that most Americans don’t like — or even know — these cakes, is that the store-bought varieties use ingredients that just don’t taste good. Like a stew, the flavors of the various ingredients that go into a fruitcake should hold onto their individual characters, even as they blend together to form an overall impression. A good fruitcake offers a variety of fresh nuts, dried fruits with a range of flavors (not just an endless parade of raisins), and candied fruits and peels made with real skill to preserve their flavors and textures. All this stuff can be hard to find and costs money. So if the search for the components of a proper fruitcake won’t give you pleasure, you should probably forget the whole thing. It’s precisely because the ingredients are rare that the process — collecting the ingredients, baking the cakes, and bathing them with brandy as they ripen over a couple of months’ time — takes on meaning and importance. With every moment or dollar I spend in this enterprise, I feel that I’m doing something special. That makes the gesture feel special. And in some distant way, it makes me feel special, too. Finding nuts isn’t much of a challenge; I use equal portions of pecans, English walnuts, hazel nuts and black walnuts. Black walnuts aren’t as easy to find as the other three, but their deep and oily flavor makes a good base for the higher-pitched notes some of the fruits will bring. Dried fruits are pretty easy to come by these days, too. So arriving at a suitable mix of flavors, colors and textures isn’t a big challenge; figuring out your own mix is part of the fun. A small portion of raisins is fine, but too many will leave the cake with an insipid uniformity of taste. 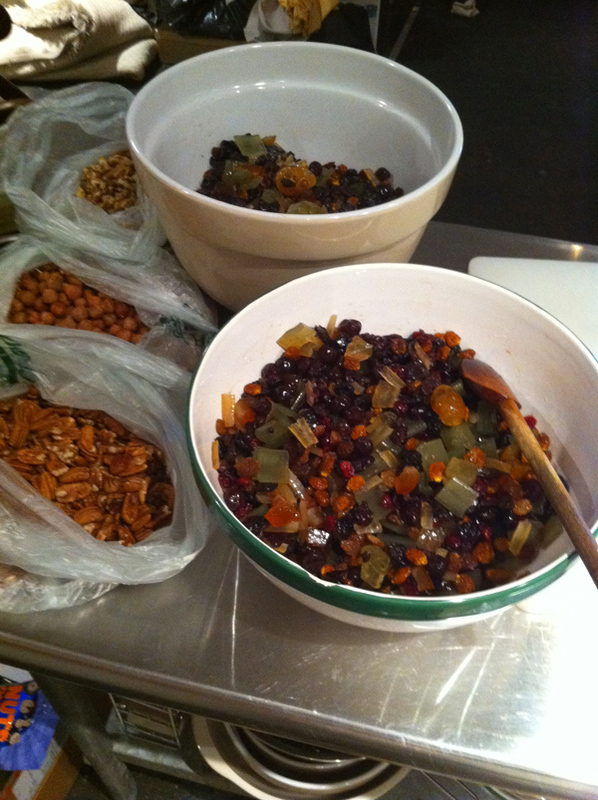 I use black or red raisins (Thompson or Red Flame), along with some golden variety and even a small amount of currants. Try to get organic varieties whenever possible, if only to avoid the nasty addition of sulfur dioxide used to keep light-colored fruits from turning brown as they dry. Cape gooseberries add a bright tang to the whole, as do dried cranberries. Dried sour cherries contribute a surprising richness with their combination of sweet and sour. Candied fruits present the biggest challenge. When I was a kid, you could find containers of mixed ones in the baking aisle of the local Stop & Shop. And those same nasty, particolored bits are still available in most stores today. But you’ll want to find candied fruits and peels that would be delicious to eat on their own, confections made with care and skill. For reasons I don’t understand, it seems that no one on this side of the Atlantic wants to put that kind of effort into their production. So we look to the other side. I’ve always found a great selection made by Agrimontana at the Chelsea Market in Manhattan. When I moved to Toronto this year, I brought this year’s supply along with me. Until I find a local supply, I’ll continue to rely on my New York source. Candied sour cherries, lemon peel, orange peel, grapefruit peel, whole clementines and citron sparkle like semi-precious stones when you cut them into pieces large enough to be recognizable in a slice of cake. 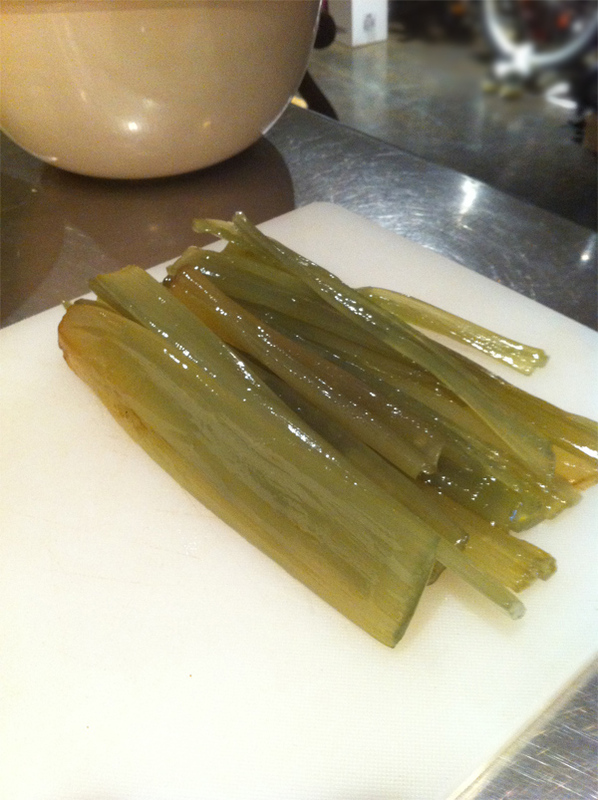 But the most important ingredient — and the most difficult to find — is the candied stalk of the angelica plant. [For a quick point of reference, consider that angelica is a primary ingredient in Chartreuse.] I can’t say with confidence that without its subtle herb flavor the cakes would taste any different; I’m not even sure that anyone knows it’s in there besides me. But its importance grows in direct proportion to the difficulty I have finding it. The more precious the ingredients, the more precious the gift … you get the picture. Come Labor Day weekend, I mix all of my finds with a lot of eggs and butter, some flour and blackstrap molasses, and a healthy dose of allspice. 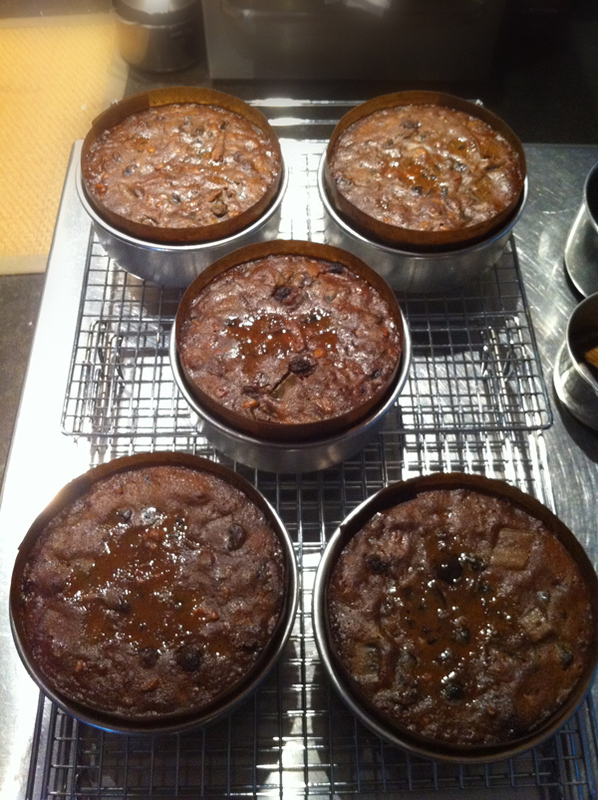 Then I bake them slowly for three hours or more and bathe the finished cakes in brandy over the next eight weeks. In early December, I pack up each one, attach the gift card I’ve made to describe each carefully considered ingredient and ship them off. From most of the recipients, I get a polite acknowledgement; from some, no acknowledgement at all. A few dear friends seem to recognize how much the giving means to me and send a heartfelt note in return. But my closest friend always gives me so frank and detailed a critique of each year’s offering that I truly feel the connection I hoped my gift might conjure. Another Christmas comes and goes. But for a moment, I feel connected; wrapped warmly in a web strung between the past and the present, among friends and family far away. And inside that web, I have shape and meaning and purpose; maybe just for a moment, but in the scheme of things, a moment like that is nothing to sneeze at. † Irving’s The Sketch Book of Geoffrey Crayon, Gent. (1819-20) contains a string of stories about a country manor where Christmas is kept as tradition would have it. However, the traditions described were carefully fashioned to fit a new ideal of the holiday; one much more domestic and far less raucous than in documented traditions of the period and preceding centuries. 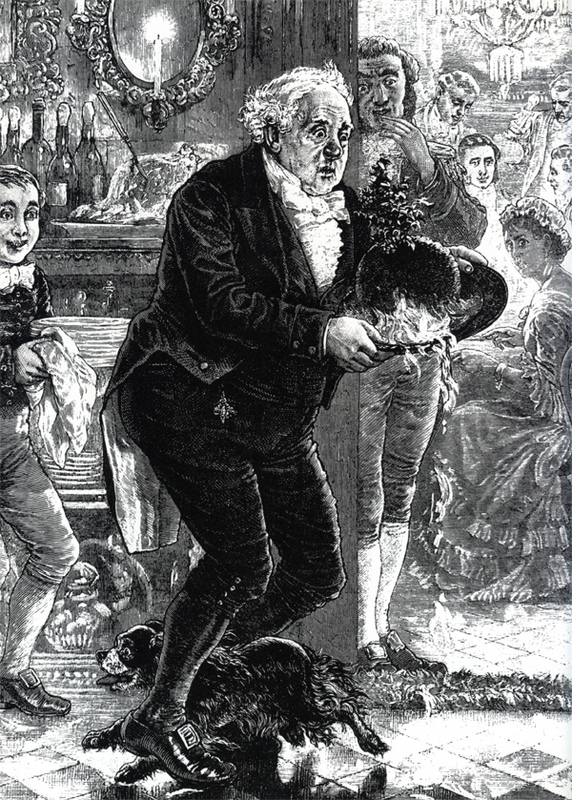 Similarly, Dickens’s A Christmas Carol (1843) uses the holiday as a method to promote his very personal political agenda: charity and social conscience over the encroachment of an industrial economy ever more ruthless in its use of (and contempt for) the lower classes on whose backs it was built. Interestingly enough, the politics of the two authors couldn’t have been further apart, one from the other. For a careful and truly inspired examination of the origins of our modern Christmas holiday, see The Battle for Christmas (Stephen Nissenbaum, Alfred A. Knopf, 1996).